In celebration of the dog breeds that course the fields, marshes, lakes and mountains during the fall hunting seasons, we’re listing 10 of the best breeds for bringing waterfowl, upland birds, big game and small game to hand. Labrador retriever: The epitome of the all-around dog, the Labrador can hunt upland fields, works as service dogs in tasks as varied as police work and guiding the blind. However, their true calling is as a retriever in water – first fetching up fishing nets off the coast of Canada and later picking up ducks and geese for waterfowl hunters. Heavy, double coats and webbed feet make them adroit in the water while their disposition and desire to please make them easy to train. Runner-up – Chesapeake Bay retriever: The only American-bred retriever, the Chessie is a hardy dog that was used extensively by market hunters the Chesapeake Bay area. Their wavy, double coat is typically oily, which makes them perfect dogs for cold-water retrieving. Possessing a strong will, Chessies tend to be one-man dogs that are determined to get the job done. German shorthair pointer: Fleet of foot and bird crazy, shorthairs are a sleek dog that will pursue pheasant, chukar, quail and grouse. Their amiable personality make them a pleasure for the novice to train, but their drive for the hunt makes them perfect for even the most die-hard hunter. Runner-up: English setter: As regal as it is competent, the English setter possesses a keen nose and softer disposition than other setters – but that doesn’t mean they’re soft dogs. English setters are a great dog for the grouse and quail hunter, and they are even used by some as turkey dogs. Their long hair and feathering give them a majestic look in the field (and requires more care at home). Treeing Walker hound: Perhaps the best all-around big-game dog, the treeing walker is a stable in dog packs used to hunt cougar, bear, deer and raccoons. Their superb nose, prey drive, voice, range and speed make them a favorite of both hunters and those competing in trials. Hot-nosed and ready to go anytime, it’s tough to find a better all around hound. Runner-up – Plott hound: With an excellent nose, athleticism, endurance and tenacity, the Plott is a big-game dog that can track days-old bear, cougar and hog scent through the nastiest of cover. Descended from German dogs used for wild-boar hunting, the hounds were brought to the U.S. in 1750 and were developed by the Plott family in North Carolina for hunting big game in the New World. German wirehair pointer: Athletic and tough, the German wirehair pointer can do it all. They have the nose and stamina to track big and small game, the birdiness to get after upland game and the mental fortitude (not to mention desire) to retrieve waterfowl from cold water that would put most pointers off. Their distinctive wiry coat protects them from cold and harsh habitat while on the fall and winter hunts, but is thin enough in summer to and the early season to keep them from overheating. Runner-up – Pudelpointer: A combination of German hunting poodles and English pointers, the pudelpointer is an under-the-radar breed (in the U.S. anyway) that was developed to track, point and retrieve game on both land and water. Very similar to the German wirehair, from which it was part of creating, the pudelpointer possesses a dense, wiry coat. Beagle: The ideal rabbit dog, the beagle packs a dogged disposition and determination, as well as a voice, into a small package. They will give chase individually or in packs and won’t quit until its prey is cornered. One of the most popular dogs in the country, beagles are a favorite pet and are used extensively as detection dogs; their small size give suburban- and city-bound hunters a chance to keep a hunting dog. Jack Russell terrier: Developed for hunting foxes and other den/burrowing animals, the Jack Russell is a tenacious terrier when it comes to just about any prey that it targets and chases – particularly squirrels. With energy to spare, Jack Russells won’t stop chasing until the hunt has concluded – and because they can be such independent dogs, that doesn’t always require a human hunter to be a part of the action! 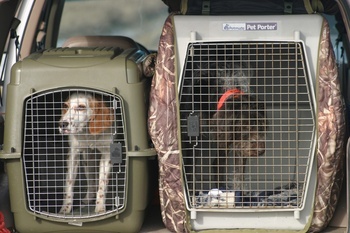 When considering which breed of dog to get for hunting and home, you have to weigh what each breed brings and evaluate if those align to both your hunting needs and style, as well as your home life. And regardless of which breed you decide to bring home, and then spend hours training, selecting a puppy from genetically screened parentage can save you time, money and heartache. You can spend hours Googling a specific breed and trying to find a reputable kennel, or you can check out sites that stockpile the information and list breeders by breed. One such site is huntingdogusa.com. They have many different breeds you can search among - from retrievers to pointing breeds to hounds. Placement on such a site doesn't guarantee a good hunting dog; it only makes finding breeders/kennels easier. The real work begins wit identifying your needs and weeding through the list and eliminating those that don't meet your criteria - from color and looks to style and health.